SUP commonly known as Stand-Up Paddle Boarding has become more popular than ever. It is a well-known eco friendly sports that is great for a workout, entertainment, and even your health. It is comparatively easy for anyone and comes with tremendous health benefits. You can take your whole family and enjoy SUP without feeling guilty of destroying the environment. It will give your kids some time away from their gadgets and indulge in outdoor activities. The sport merely needs a stand-up paddle board and gives you the best time of your life, loaded with thrill, fun, and health benefits. Also, it can be enjoyed anywhere such as a lake or a canal. You don’t necessarily have to be near a sea or an ocean. For all those that want to learn about the health pros of SUP, this article will surely help them. Here are some of the significant health benefits of SUP. SUP requires you to be in the upright standing position. Since the paddle board is moving on the waves, you need to have immense core stability and leg strength so that the much-needed balance is maintained. When you start SUP regularly, then it doesn’t just improve your balance while being on the board but also enhances in the day to day activities. At the same time, it also fortifies your focus. Water is the best soothing agent as it gently calms your nerves. Many people like to spend their time on a beach so that they can hear the voice of the ocean, the waves running back and forth and so on. 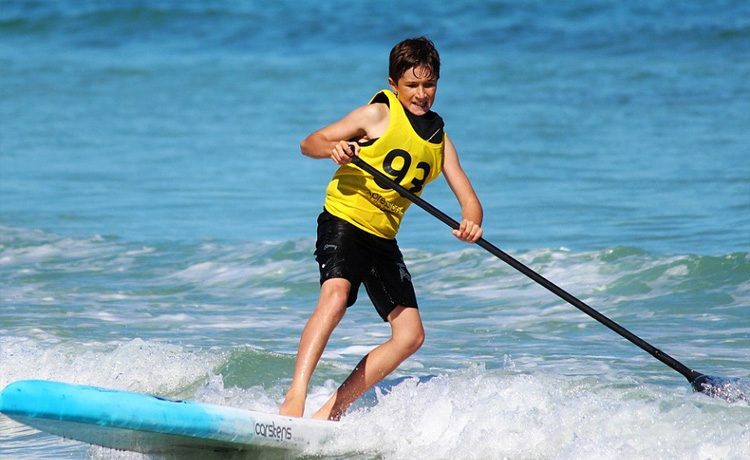 If you love water, then SUP can be a pretty useful and stress-reducing activity. The mesmerizing sound of the water and the thrill of being in the water will take away all the stress. Do you know, with SUP you can prevent heart attacks and strokes? Paddle boarding is quite similar to health workouts such as aerobics, cross training, or running. All these activities improve cardiovascular health and reduce the risk of a stroke or heart attack. While paddle boarding, almost all the muscles of the body gets to work. You need to maintain great balance in this sport, and due to which, the leg muscles become hard in an attempt to stabilize your centre of gravity. Arms, back, and shoulders propel the board in the water. Also, to maintain balance, the back, and abdominal muscles are also continually working. This way, the entire body is put to work. It is a great full-body workout. Most of the water sports put much strain on the body. This can lead to the damage of ligaments, muscles, and tendons. SUP is a low impact exercise and completely harmless. Experienced sportsmen claim that this sport helps them in burning the calories and does not bring any damage to the body. The runners who have a problem with knees or hips will find this exercise equally productive and low impact. After spending a long day exercising or gymming, you feel soreness in the body. Same is the case with paddle boarding. However, the pain is good because it helps in building the overall strength of the body. The yoga enthusiasts who want to push their work out a little can combine it with SUP. To some, it might appear to be an unusual combination but many people are successfully doing yoga poses on a paddleboard. It increases your core strength and improves posture. Beginners can start with simple poses such as downward dog. However, there is no limit for experts to try their expertise. No doubt that doing yoga on a paddleboard can be extremely challenging, but it is also profoundly calming. You can also polish your yoga techniques. As we said before, this is a low-impact activity. It is highly suitable for the people in rehab. It increases their strength without doing any harm. Also, it does not tire or strain the joints and muscles. After learning SUP, you begin to master the art by increasing the endurance of continually paddling. Constant paddling will take your muscles to a point where they will stop tiring. This way, the tolerance is improved. Your reason for paddle boarding could be anything, from fun to enjoying the thrill, calming the nerves, relieving stress, or just taking care of your body. The sport has become extremely popular among youngsters and kids. In the end, SUP is all about exploring a new form of workout, excellent family activity, and so on.